Caps for the weave poles (optional) to keep out dust and rain. 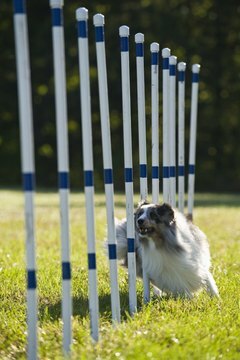 Agility is a great sport for you and your dog. Maybe you've taken an agility class and are hooked--so you want to start doing agility work on your own. The appropriate equipment for most beginners involves a board (easily bought) for contact work, 2 jumps (easily made out of PVC) and a set of weave poles. Most beginners in American Kennel Club, United States Dog Agility Association, Inc., or The North American Dog Agility Council will only need to do 6 weaves on a novice course. But you should make 12 weave poles because once you graduate from novice you'll need to do 12 and it's easier to make the 12 weaves that connect all at once rather than have to remake your set of 6 to connect 6 more poles. Decide which organization you're going with. USDAA requires a distance between weave poles of 18-21 inches, AKC is 21-24 inches. To a veteran dog, she can do either easily. But you'll need to start somewhere and make your measurements consistent. The USDAA weaves will take up less space (which is usually a storage problem) and will be easier to move around. Plus, you can always insert larger pieces to be AKC compliant. Cut and finish the weave poles. USDAA says weave poles are 3 feet in height, AKC 36-40 inches. Cut 12 weave poles of at least 35 inches (remember, the weave pole goes into a "T" joint which raises it off the ground 1-2 inches so if you measure and cut at 36 inches you'll end up with a 37-38 inch weave pole). Once you've cut your 12 weave poles--do the finish work. Put colored tape on them (usually 2-4 consistent in height rings). Ideally, do this at the dog's eye-height (to provide a distraction and thus better training for your dog). Don't just slap the tape on--make the pattern consistent. And don't worry about the color you use--you'll eventually change it as you become more serious at agility to give your dog exposure to a different look. So if your dog's head is at about 20 inches than put the stripes there. If you don't have colored tape, using masking tape to mark off stripes and then spray paint them. Once you're done, set the 12 weave poles aside. You do the weaves first to make sure you don't accidently use the weave poles on the base or supports. Don't worry about having extra PVC lengths of as little as 4-6 inches left over--you'll use those pieces as supports on the base. Lay out and start measuring the base. Your base will consist of 12 "T" joints (with base PVC going into each end and the pole going into the middle part of the "T" joint) with 4 "X" or "+" joints used to provide support to the base. Now, the distance from weave pole to weave pole must be consistent so your dog is trained right and develops a rhythm to doing the weaves. Depending upon the organization, spacing is 18-24 inches. But what complicates this is that the "T" joint will take up about an inch on each side. So if you're cutting an 18 inch spacer for the base, you'll actually cut 16 inches and then put a "T" joint on each side (which will bring it to 18-19 inches. 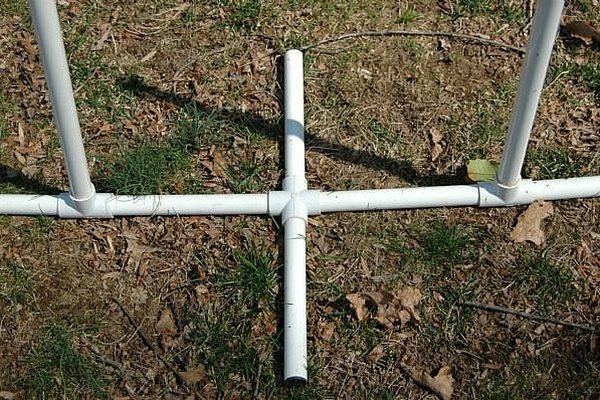 Additionally, about every 3 poles, you'll want to add an "X" or "+" joint that lays flat on the ground that support pipes will come out of keep the entire set of poles from falling to one side or the other. So on any base pipe you insert an "X" joint to, you'll need to subtract another 2 inches. Before you start cutting, lay it all out and measure. Then cut, assemble and measure again. It's not critical that you be 18 inches or 20 inches. But it is critical that the distance between poles be consistent whatever length you choose. To glue or not to glue--that is the question! Some people glue their weaves together. This prevents them falling apart, makes lifting and moving all weaves simultaneously much easier and it's better with big dogs who tend to knock the weaves akimbo with their tail when they go through quickly. I would recommend not gluing your new PVC weaves. First, it's easier to take them apart to either store them (if space is tight) or to take them to the park or another backyard. To become reliable on the weaves, dogs need to do them in different locations so the ability to disassemble and move your weave set is valuable. Additionally, with joints that move, you can tilt the poles (to form "V's" or channels) that are very helpful for teaching novice dogs to weave faster. Final assembly of your weave poles. It's time to put it all together (weave poles into the "T" joints, "T" joints connected to the base spacers, "X" or "+" joints inserted between some "T" joints). Add the base support poles. On each of your "X" or "+" joints, you'll have one of each side connected to a base spacer (running from one weave pole/T joint to the next). 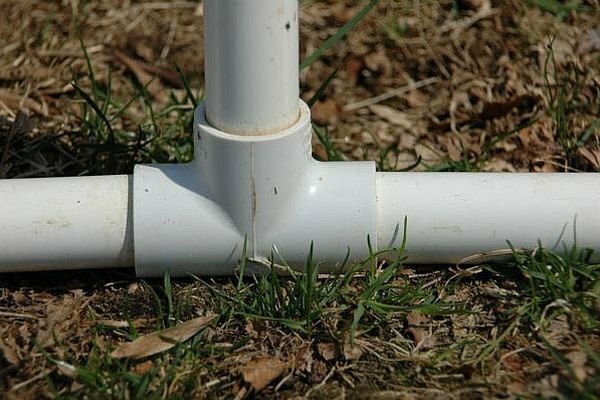 Take your spare PVC pieces (at least 4 inches in length up to 8 inches as the max) and insert them into the spaces that are perpendicular to the direction of the base PVC. This provides your support. If you bought caps, this is the time to insert them in the ends and tops of the weave poles. I have two sets of 12 PVC weave poles and none have caps--I've had no problem with water or dust collection but they do look nicer and more finished with a cap to the end of the PVC pole opening. Once it's all been assembled, measure again (from one weave pole to another). Length of the support bars isn't critical. It isn't even that critical if some weave poles are 1 inch too tall or short (it just looks a little ragged but only a really big dog like a Wolfhound will notice height differences). But the distance between weave poles is what matters the most--you want to be within 1/2 inch if not exact for all of the weave poles. So you may need to do a little trimming of the base/spacers to insure that your weave poles are similar distances apart. Once it's assembled, it's time to start weaving. Some people like to put a piece of masking tape on each piece of PVC and label what part it is (weave pole #1, weave pole #2, base between #3 & #4) so that assembly is easier if you have to completely disassemble your weave poles. Disassembly may be necessary if space is tight or you want to take the weaves to a park (and don't want to spend 30 minutes assembling them by trial and error). If you don't have any training on the weave poles, hold off until you get more information (such as the next article in this series on agility equipment!). Otherwise, you'll teach your dog some bad habits and just get frustrated. It's very easy to teach a dog to do the weaves competitively--but only if you know the right methods. It's very easy to accidently end up with "T" or "X" joints that won't fit your PVC because you bought the wrong size. And it's always better to have 1 or 2 extra joints. They're cheap (so spending the extra .75 isn't extravagant) and that way you have a replacement in case one breaks.